Donald Trump says NDAs for the famous and wealthy are just a matter of course. Following the revelation Wednesday that President Trump had reimbursed his personal attorney Michael Cohen for a $130,000 payment to adult film star Stormy Daniels, Trump went on to say the business transaction violated no campaign laws and then boasted that nondisclosure agreements such as the one signed by Daniels on his behalf were very common for "celebrities and people of wealth." 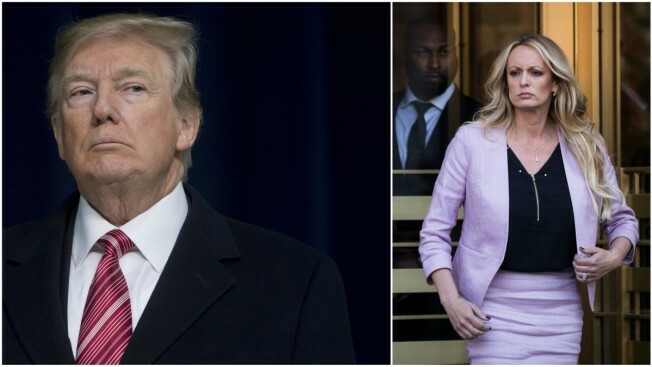 Trump also tweeted that his legal team would be seeking financial damages against Daniels for violating terms of the agreement. Indeed, NDAs are a matter of course not only for celebrities, but for the non famous as well. A recent report by the Harvard Business Review revealed NDAs are becoming increasingly common and that over one-third of the U.S. workforce is now bound by some form of NDA. And yes, those NDA's can cover many things including prohibiting individuals from revealing intimate details about sexual encounters. Neil Wertlieb, a lecturer who specializes in contract law at UCLA School of Law, said NDAs are not at all uncommon for high profile individuals attempting to keep their privacy under wraps and that those contracts are typically enforceable "if they're not designed for unlawful purpose." "Absent or unlawful purpose they are really no different than contacts which require mutual consent and consideration. If both parties to an NDA are making promises to the other party, it's important that they are both signatories to the contract. For them to be absent in a signature it’s hard to say that commitment made by somebody in the contract is binding to the other party if that person has not signed the contract, which is obviously the issue in the Stormy Daniels and President Trump case," he said. "Sheen’s or any Related Parties’ business matters proprietary business information, financial matters, legal matters, contractual matters, personal matters, private residence locations, unlisted telephone numbers, private email addresses, security alarm codes, calendars, household activities and guests, health and medical information, fitness, sexual matters, leisure activities, lifestyle, proclivities, customs, and private conduct." The proliferation of NDAs has also come to light more recently in wake of the #MeToo movement. Disgraced movie mogul Harvey Weinstein had several women, including actress Rose McGowan, sign NDAs to prevent them from discussing his alleged predatory behavior. Zelda Perkins was a former Weinstein assistant who was among the first of his accusers to break an NDA to stay quiet after keeping Weinstein's secrets for nearly 20 years. She told The Financial Times in October that Weinstein sexually harassed her "on every occasion I was alone with him" and said she spoke out in part to demonstrate "how egregious these agreements are." Perkins isn't alone. In December a woman who had reached a settlement agreement with Bill O'Reilly sued the former Fox News host for defamation and breach of contract, saying in a lawsuit public statements he and the network made violated the terms of their settlement. Several crew members on Trump's "Apprentice" previously reported they had been required to sign NDAs to prohibit them from revealing Trump's often crass behavior on set. A former crew member who signed a nondisclosure agreement and asked not to be identified to The Associated Press, recalled that Trump asked male contestants whether they would sleep with a particular female contestant, then expressed his own interest. According to an AP article in 2016, 12 former contestants or members of the crew spoke on the record about what they described as Trump's inappropriate behavior. Another nine spoke to the AP about their concerns regarding Trump's treatment of female colleagues but said they did not want to be identified because they signed nondisclosure agreements, or were concerned about wrecking their careers or retaliation from Trump.